The colt’s racing career is over, his crushing injury witnessed by a crowd dressed for a wedding instead of a funeral. The stunning picture of jockey Edgar Prado, standing on the racetrack, leaning into and supporting a horse that had given himself over to his rider’s care. The rest of the Preakness field was long gone and unaware. It’s late on Monday now and the surgeons at the University of Pennsylvania, after five and a half hours of surgery, say the colt’s life is still ‘a coin toss.’ But he’s standing on the leg that suffered a shattering injury and he’s eating. The feeling is, unless something goes terribly wrong, he’ll be okay. Terribly wrong is not always controllable. Unless something went terribly wrong, he was a strong favorite to win the Preakness and go on to a shot at the Triple Crown. Like many of you, I spent what was left of my weekend, the Saturday night and Sunday part, with Barbaro never far from the edges of my mind. I walked my Labrador and thought about him, ate dinner, showered, brushed my teeth and went to bed, all with the image in my mind of the colt and his jockey, leaning into one another, holding each other up. The power of loss. We’ve lost so much these past years in America. I wonder at the fact that in the prop-wash of terrible news emanating from a terrible world, piped into our consciousness on a daily basis, the crippling of a two-year-old thoroughbred colt grabs so tightly at our collective gut. It may be that this is a heartache we can get our minds around, the destruction of a young horse’s career, come apart so nakedly in front of a hundred thousand screaming fans, caught in mid-scream. The rest is too big. We are vulnerable and likely to compartmentalize the young men continually shot to bloody pieces in as unloved a war as this nation has ever fought. Embracing that loss too closely is dangerous territory, a place we mostly dare not go. Tens of thousands raped and murdered in Darfur, a planet in critical condition, whales grounding, immigrants chased down in American deserts, the wheels coming off our government, it’s all too much, too constant, too impossibly out of reach. So we love the colt. And why not? We need something clean and pure, gallant and untarnished to hold dear. God love him for that, he never let anyone down. Nor have his doctors, his trainer, owners or the weeping jockey who held up a half-ton horse with his hundred-ten pound body. 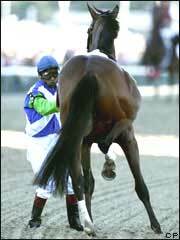 Barbaro will recover, because it’s his destiny to achieve that one final miracle for us. With any luck at all, and it’s his turn for luck, he’ll live another twenty-five years. He has no knowledge of what he’s missed, no understanding of careers or trophies or world recognition. Possibly, that’s another touchstone for those of us too closely tied to careers and trophies. A life at pasture. A new career making expensive little thoroughbred babies. Someone to scratch his nose, find an apple in their pocket and lean into him when he needs it.